The author is a friend. I have done my best to give an unbiased review. 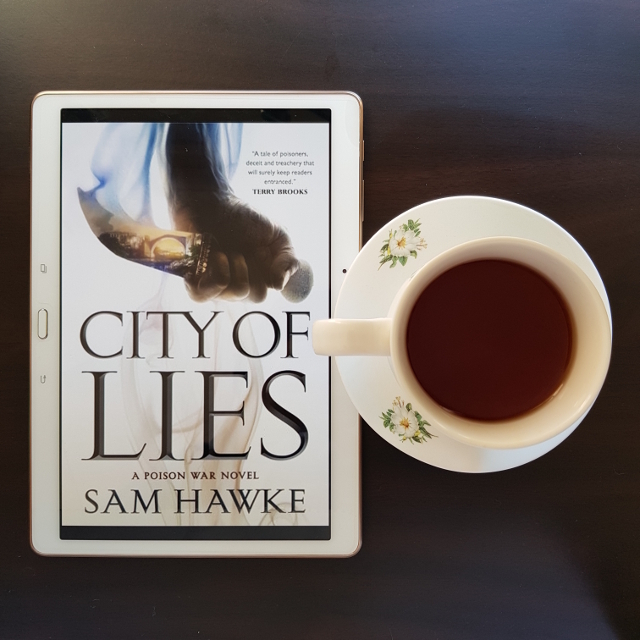 City of Lies is an enthralling novel that subverts fantasy tropes to examine issues of family and class. The story is told from the point of view of two siblings, alternating chapters from each of them. Jovan is a proofer, a young man trained to detect the presence of poison in food. He’s bound by honour and friendship to protect Tain, heir to the city of Silastra. That suddenly becomes harder when both his uncle and the Chancellor are killed by a mysterious poison. Flipping the usual focus on the poisoner to the person trying to prevent the poisoning really raises the stakes of the story, since the latter is much more difficult. Jovan is also obsessive-compulsive, with his compulsions increasing during times of stress. He worries about the judgement this brings from others, but is supported by his sister and Tain. Kalina is the elder of the siblings and was originally destined to be the proofer. However, it became apparent early in her training that her chronic illness made this unfeasible. While she still harbours some resentment over this, she is fiercely loyal to both Jovan and Tain. She’s also determined not to be sidelined, turning instead to diplomacy and spycraft to prove her usefulness. However, her brother sometimes makes this difficult by being overprotective. This isn’t entirely without reason; there’s an interesting interplay between Jovan’s somewhat patronising attempts to make sure she rests and Kalina’s tendency to push herself too hard. There are some mystery elements, as the siblings and Tain try to figure out who poisoned their uncles. These elements dovetail into the political landscape of the story. The Chancellor may have final say on what happens in the city of Silastra, but he is supported by a council comprised of the heads of several powerful families and guilds. Of course, council members are largely only there for their own interests and it soon becomes apparent that (as the title suggests) each of them has their own secrets. Sorting through those secrets to determine which of them is the killer creates a tension throughout the narrative. One of the things I loved about the story was the way it looks at the role Tain plays as Chancellor. He should be the most powerful man in the city and yet the story shows just how little power he has. He is not ominpotent or omnipresent, which means he has to rely on others. And, as the poisoning of his uncle demonstrates, those others can’t always be trusted. There are also issues of class at play. Jovan and Tain, in particular, come face-to-face with the privilege of their upbringing and the blind spots it has created. I especially enjoyed seeing Jovan wrestle with this because even when he’s made aware of it he struggles not to centre his own experience. Family is at the heart of City of Lies, but not quite in the usual ways. It centres the siblings’ relationship not by dwelling on their rivalry but by showing how they function as a team. It also downplays the role of traditional parents. I’ve spoken a bit of uncles in this review, and they connect to an interesting piece of worldbuilding. Silastra has what we would consider some different norms around motherhood; the role of child-rearing is taken on by a trusted male relative of the mother’s, leaving the mother free to pursue other interests. This male relative is referred to as a Tashi and is frequently the uncle of the child. In contrast, the father of Kalina and Jovan is considered so insignificant, he’s not even mentioned. Their relationship with their mother is distant. This setup allows the book to avoid some of the sexist norms usually present in epic fantasy. From the very beginning, the writing style sucked me in (and kept me awake far too late). Silastra is vibrant and alive, painted in detail but not enough to be overwhelming. The pace is kept reasonably swift and although there’s often a lot of talking (councils will do that), it’s balanced with plenty of action. The ending wraps up enough threads to be satisfying but leaves open some questions regarding the bigger picture. I did have some quibbles about some of the supernatural elements of the ending, but overall they didn’t detract from the story. All in all, City of Lies is an impressive debut and among my favourite reads of the year so far. And, considering the epilogue, I’ve got my fingers crossed for more. Thanks for sharing this review. I’m interested in the chronic illness component, so I’ve put it on the list! I’d be interested to hear your thoughts on it, later down the line.